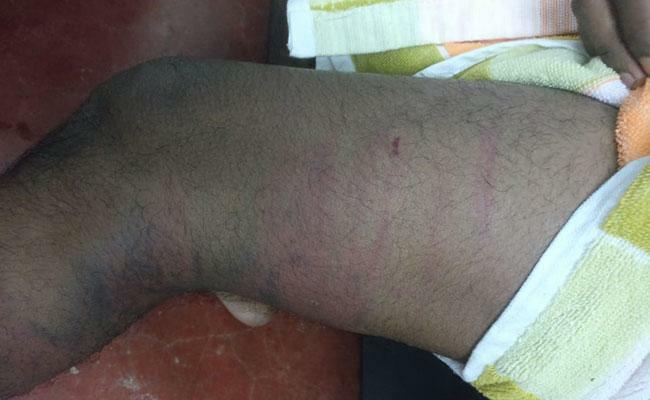 In a ragging case from Kerala's Idukki's college, a first-year student of technology institute was allegedly brutally ragged by his seniors. The victim has been hospitalised after he was mercilessly attacked and sustained severe injuries on his legs. As per reports, a case of ragging has been filed against the five second year students following a complaint. The incident took place at the DC School of Management and Technology in Kerala's Idukki district. In the medical report, a doctor said swelling and dehydration, among other injury signs, were noticed on the student. "I was beaten up for almost three hours," 23-year-old first year student Athul Mohan told media. "I was threatened of dire consequences and forced to accompany the seniors outside the campus.” "They asked me to hold a rod and a cellphone in one hand. Then they whacked me with sticks on that hand, threatening that neither the phone, nor the rod should fall," he said. When the phone fell, the beating started in earnest. Well, several freshers have alleged that ragging is a regular occurrence in the campus. Many said they are too frightened to leave the hostel, because of the ragging. "Three senior students have been suspended and an enquiry committee has been constituted with a deadline of September 15," a college administration source told reporters. "A complaint has also been filed with the police," the source said. The victim, who joined the college on June 22, said to escape ragging, he had lied to the seniors. "I told them that I get the fits. They somehow got to know that was a lie, and they beat me up severely on Wednesday evening," he added. "The student has withdrawn his complaint, admitting it was an error of judgement on his part," Principal Dr Shankar Rajeev said.